Tthe major headache comes when you want to sell to a business (deli or cafe), you cannot produce food for the "public" in a home kitchen for example. If doing it for friends/family i suspect you can get away with saying you are just covering costs by charging them. You would probably only have something to worry about if you made someone sick by improperly preparing the meat and as long as you take every step to avoid that you should be sweet. I've started taking a chilli bin with me to pick up bellies if i'm getting them from somewhere that's a bit of travel away, also using anti-septic spray on the benches and disposable surgical gloves. Although the gloves are mostly so i don't have to wash my hands every time i want to handle something with non-porky hands, like the scales. If doing multiple bits of meat, keep them in the fridge and take out 1 at a time. I've got a friend who works for the council who i'm planning to ask for some clarification on the laws, will update here when I get around to remembering to ask them. I need to make this, so little time on my hands though. 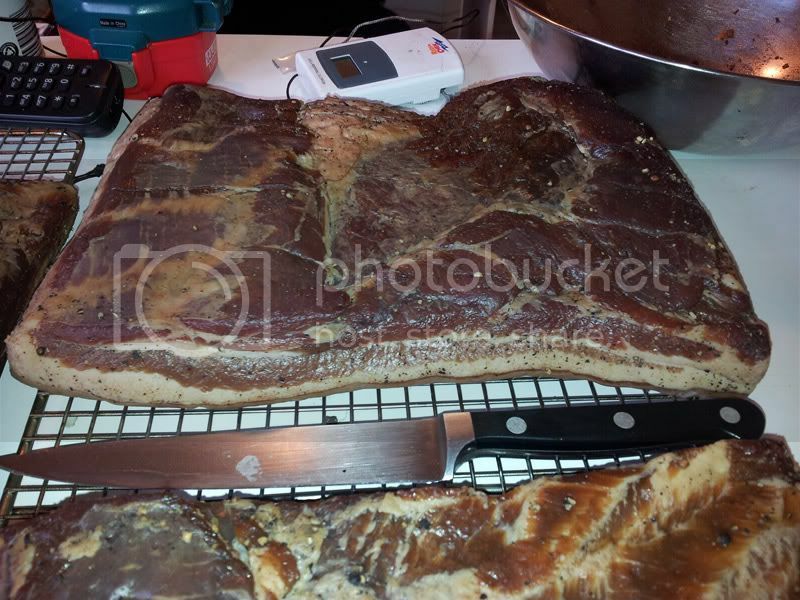 Amazing bacon thread is amazing, and oooh that pastrami looks good, too. It's going to be a good way of getting rid of the 5-6 corned beefs at the bottom of the freezer from the home kill we got some meat off a while ago. The dog sulking eating grass because i 'warned' him to stay away from the bacon. acquired some bamboo and upgraded the Weber Home Smoking Kit for higher capacity. 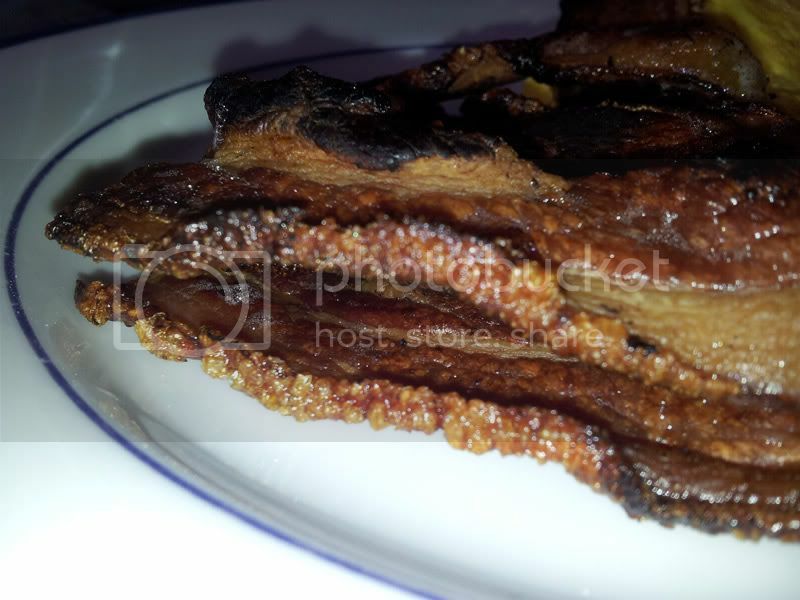 Looks wonderful, pork belly is easily my favourite cut of meat. Have you experimented with panchetta at all? Woah, super batch! How's all that going to fit in the kettle! So that storage rack thing... you leave them in there how long? Overnight? Outside? Not yet, but that'll be something i'll be looking at with the next batch. Especially if i'm able to get it from toops, then i'll be able to get a nice large uniform piece that'll roll nicely (vs a smaller supermarket cut). Luckily I don't have to fit it in the kettle ha, it was enough of a mission fitting it all into the cardboard smoko box. So you are giving it multiple smokes? Yup, someone that I gave some of the last batch too said the smoke could be smokier, so this time i'm going all out on it to see the effect. It's been through 2 ~10+ hour smokes so far, considering a 3rd depending on the weather. 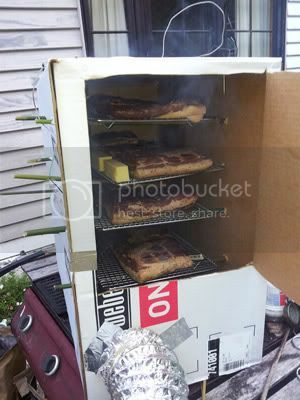 Seriously considering building a smokebox out of wood... damn non rain proof cardboard. The cheese is a block of mainland (or whichever) 'vintage' cheddar, i cut it into roughly 6 bits. 2 are control bits, 2 were smoked for 2.5ish hours, 2 were smoked for 6+ hours. We'll eat a bit of each in a couple of days, the rest in a week or two and see what works best. I've got a friend that's planning to get a bunch of raw milk and make her own cheese so this is a practice run for smoking that. Anyone have any trouble with this? 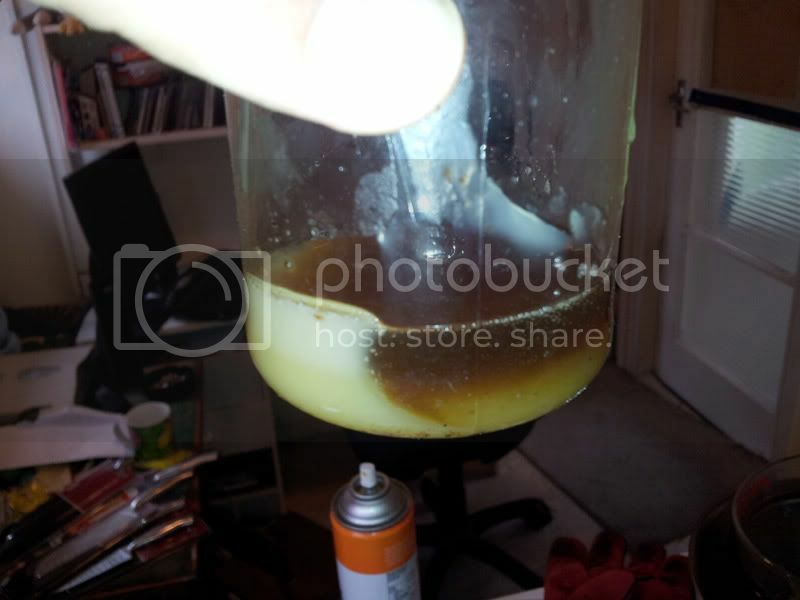 Mine has been in the fridge for about 9 days, never went hard and is now starting to smell. Did I over estimate how hard it should be? or has something else gone wrong? It won't really go hard, rather it'll go firm compared to uncured meat. It'll still be fleshy as the water content content won't have dropped much while it's in the bag, it goes hard once you hang and air dry it. It takes a fortnight or more of drying for it to really start to become what i'd describe as hard. Is there any visible spoilage? Is the smell identifiably bad, or just kind of meaty? If there isn't i'd suggest washing it off, drying it with paper towels, inspect it again for spoilage. 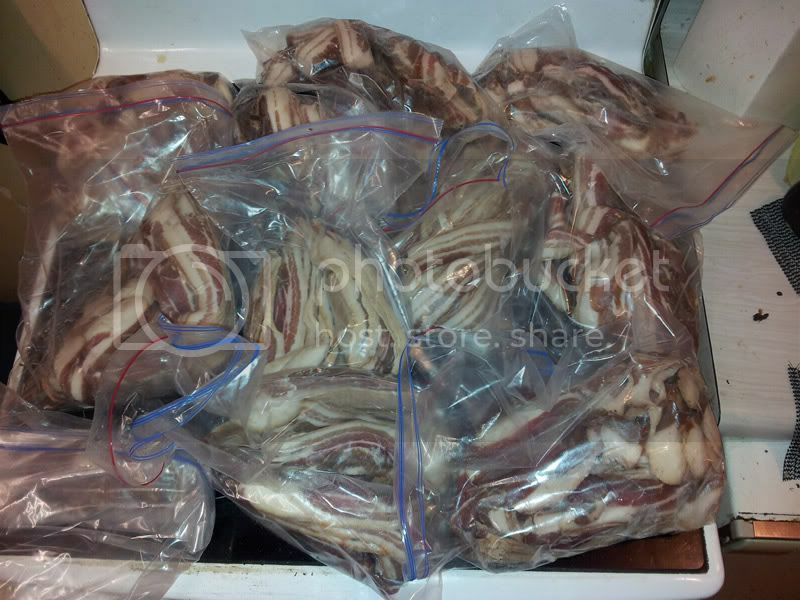 Cutting it in half lengthways would let you check the internal meat for signs of spoilage if you are worried. Provided you got the measurements of the cure right and got most of it in the bag with the meat I think you should be fine. Hmm it's def not a meaty smell. Might have to try again. Can you post any pics? If nothing else it's probably worth having a go at with a knife as a sort of post mortem to try and narrow down what is generating the smell. If it's only 1 corner for example, provided you cut it away the rest will be fine to eat. The only answer I can think of is that you might have gotten hold of an already on-its-way-to-spoiling piece of meat or possibly that the pink salt failed to distribute nicely through the cure mix and thus the meat didn't receive an even coating. And i'm only guessing that the right smell is meaty BTW (come to think of it it's probably some combination of meaty, sickly sweet and brine), it's been about 3 weeks since I last pulled some out so my memory is very vague. (If anyone else can weigh in on what theirs smelt like). Maybe add a couple of extra grams of curing salt to the dry cure mix next time to make sure you get a good distribution of the curing agent. You only need to worry about nitrite concentrations if you use 4 or more times as much as I list in the recipe so it'll still be at safe levels. It could have been that it was near best before, didn't check but had it a few days. Got 2 in the freezer so I will try one of them. The way it smells I wouldn't trust eating it. Mine gets a little bit whiffy, but it's just the smell of the pepper getting through the bag. 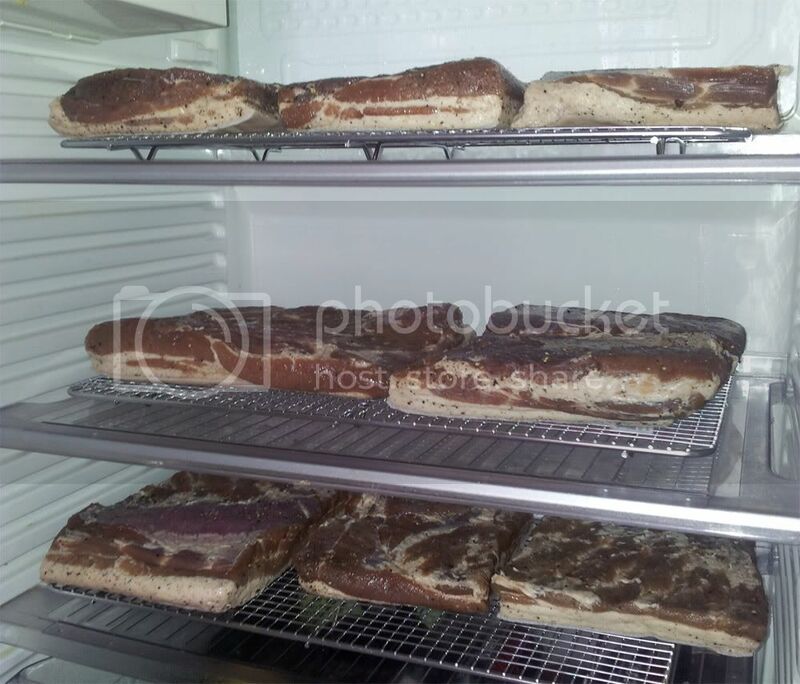 Dead, do you have a fridge just for the pork, or do you use it in your food fridge when you take it out to let it form a skin? Does it leave a bit of a smell? Definitely better safe than sorry if it's that bad. Good on you for giving it another go. One of the better suggestions i've read is to massage the pork in the bag gently each day to assist distribution of the cure. I'll be giving it a go next time, at worst it won't help but I can't see it hurting. I was stoked this weekend, I took a bag of my latest batch along to a mates bachelor party on friday for the pre-game bbq and it was well received. What made me laugh was two days later at the wedding I was chatting with someone about cooking and I mentioned bacon, he turned to me and said "you're the bacon dude? all i've heard about is how awesome this bacon is" fsking stoked! The quality and quantity of fat that renders off is mindblowing. Eagle eyed observers might notice there is one less belly than when i started. I got impatient and started hauling one of them out and just cutting off what I needed then chucking it back in the dryer. Before I knew it we'd gone through a whole bit. 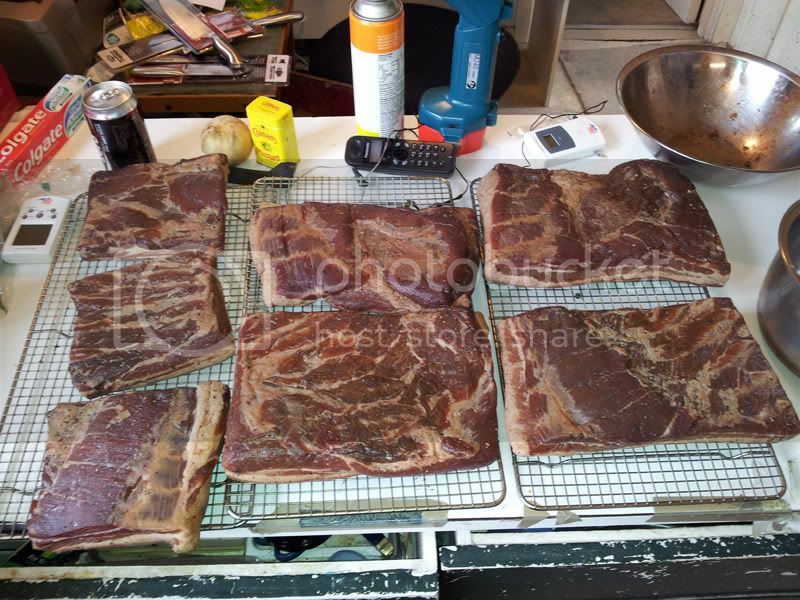 The extended smoking time really paid off too, this lot was smoked for over 30 hours total (3 runs). What's that liquid in the last shot? Keeping it for something? 30 hours is a lot of smoke! How much wood chips did you go through? 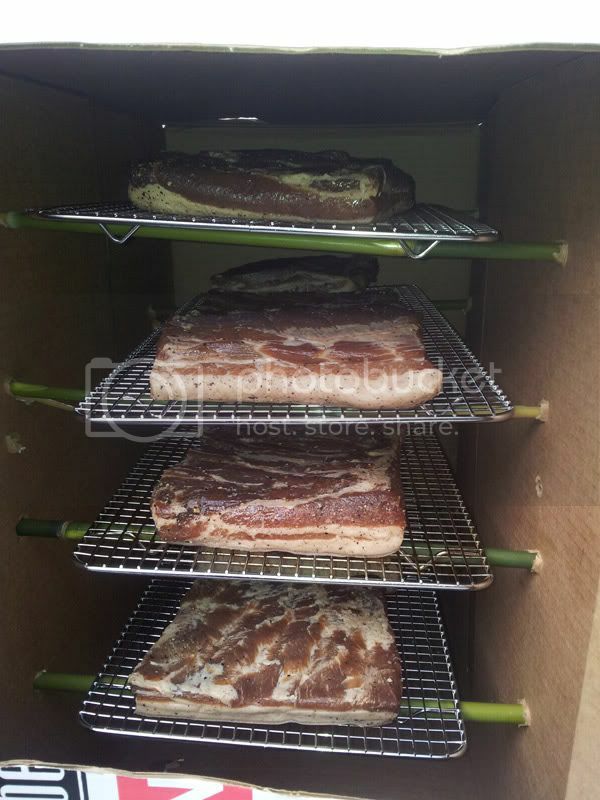 I smoked another batch in the weekend and used about a third of one of those smokehouse woodchip bags. Was hot smoked for about 4 hours at 200f. Came out very smokey. I used hickory this time compared to cherry last time, definitely more intense. I wouldn't have wanted to go further though as if you over smoke things can turn bitter. I don't use woodwhips, i just buy bags of manuka firewood and quite literally throw a log on the coals. Same deal when cooking hot, just have the end of the log in contact with a hot coal and you get heaps of smoke with no woodchip headaches. 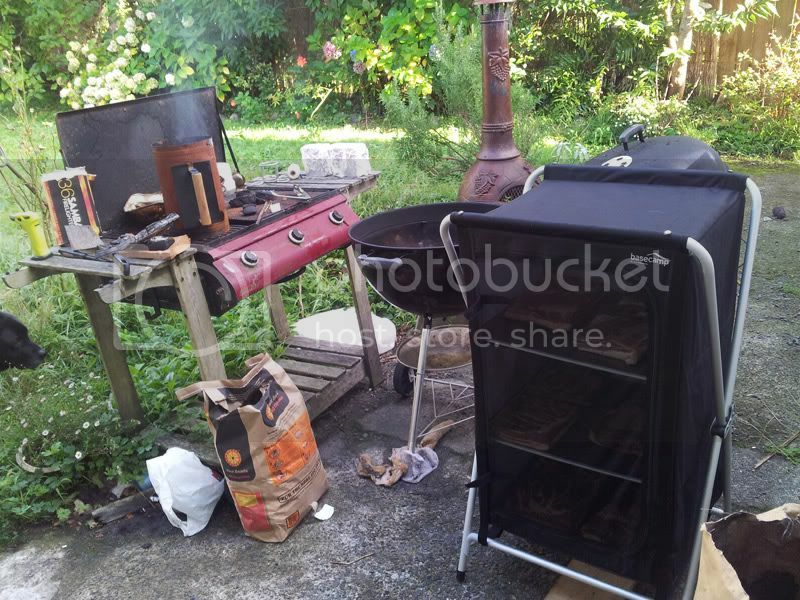 I just light up 4-5 briqs at the start, put a log on it, then check it once an hour or so, add a briq or reposition the log. I probably only used 3-4 bits of wood for the 30 hours. The over-smoking comes from having too much smoke in the chamber with poor air circulation, if you are getting 'sweet blue' smoke it shouldn't give a bitter result.